Google is doubling down with its push toward VR technology, and recent pre-orders for the new Samsung Galaxy S7 shipped with free VR Gear headsets. With companies like Hulu and Netflix announcing plans for VR-based services, and with McDonald’s encouraging customers to build VR headsets out of Happy Meal boxes, it’s clear this ain’t no passing fancy. But despite the hipster acronym, Virtual Reality isn’t exactly new technology. So where did all this talk of VR come from and how do you pick the best headset without breaking the bank? Read and learn, people. One of the earliest iterations of VR headsets is your trusty childhood View-Master. In the good old days, a circular film cell was sandwiched between two pieces of cardboard to form a disk with 14 square cutouts spaced evenly around its perimeter. Each disk contained seven unique compositions, which were presented in pairs, hence the 14 cutouts in total. The disks were inserted into the top of the View-Master goggles, which was held to your face to view each of the seven compositions, one at a time. The View-Master had a trigger on the side of the headset which advanced the disks from one composition to the next, and they were sort of magical because they had a 3D quality that made it feel like you were standing within the composition and experiencing it firsthand. View-Master disks were sold individually and as multi disk sets, often featuring nature scenes or comic book heroes. Nowadays, even your trusty retro View-Master is going high tech with newfangled VR iterations. Viewing still images in 3D wasn’t actually invented by View-Master, but originated from an old school Stereoscope, invented by Sir Charles Wheatstone in 1838. The compositions were revolutionary for the era because 3D effects like this had never been experienced before. To achieve this effect, the Stereoscope had two independent viewing channels, which isolated the left and right eyes with a center divider, so in effect, your left and right eyes were viewing each pair of images independently, and then your brain would stitch the two images into one, resulting in a 3D effect. 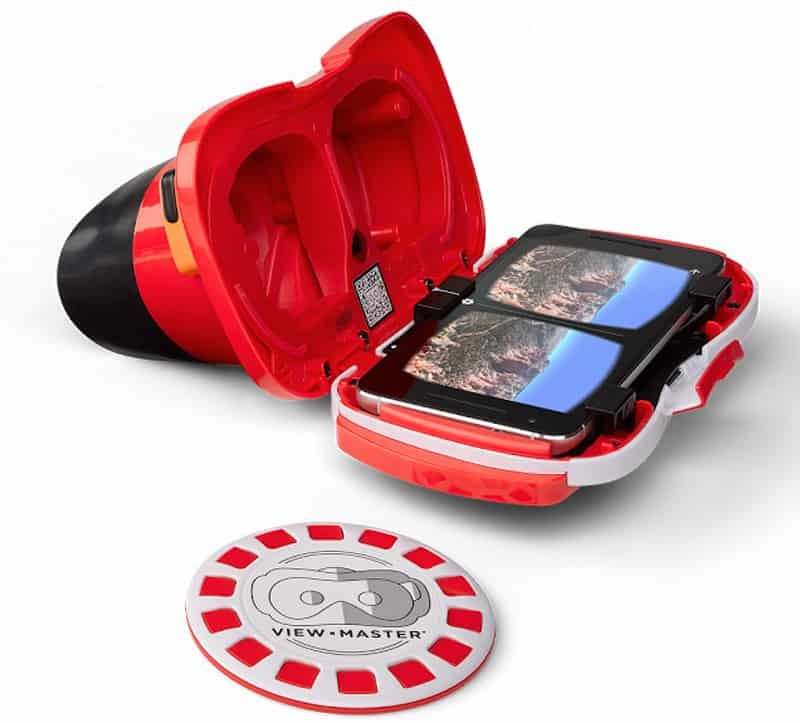 No matter if you’re using an old school Stereoscope, a childhood View-Master, or your expensive new cell phone with a cutting edge VR headset, the mechanics are identical. Newfangled VR headsets employ the same technique of separating your left and right eyes with a center divider within the headset, only instead of using old fashioned stills or View-Master disks, you’re using your cell phone’s screen as the source of your 3D content. 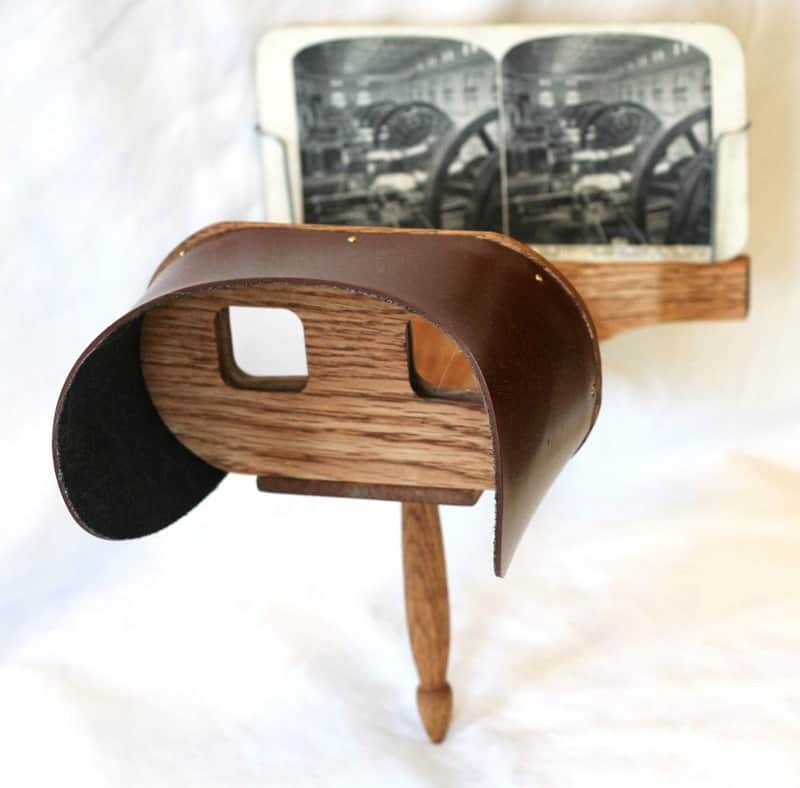 While old school Stereoscopes and View-Masters use still images to create a 3D effect, modern VR uses 360 degree video or CGI animation to add immersive movement and sound. 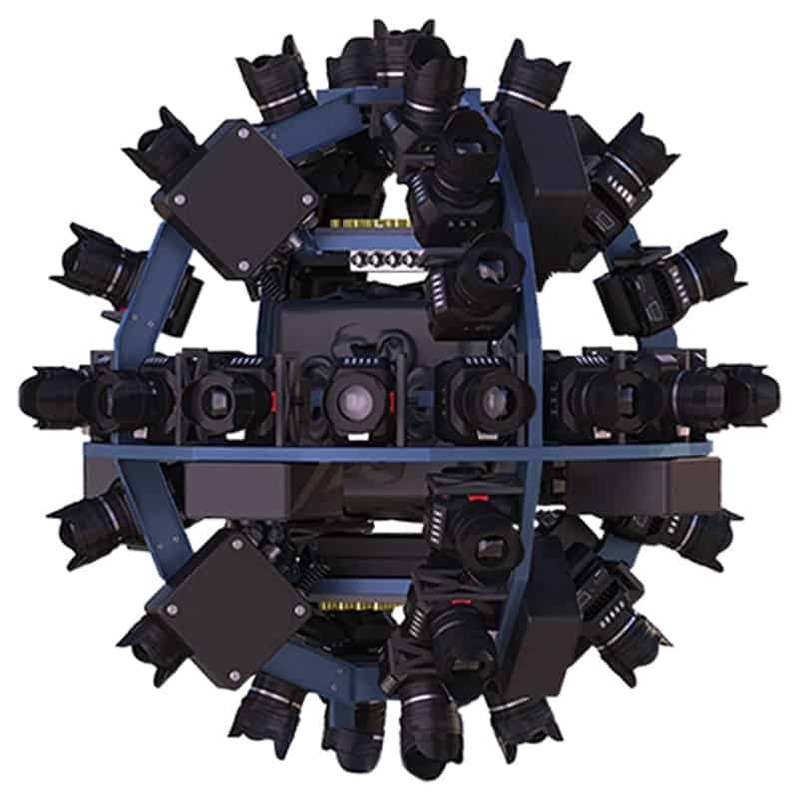 Go-Pro style video cameras are mounted onto a circular formation, and all the cameras are triggered to record at the same time. The rigs themselves can vary in style, but they all function within the same basic principal. The video rigs can then be placed within an environment, or atop a moving object, like a motorcycle, and the resulting footage offers full, 360 degree views of the landscape while wearing your VR headset. So you can actually look left or right, up and down, as if you’re witnessing the scene live. Pretty damn cool. Alternatively, CGI gaming employs the same concept to computer animated environments. Why buy a VR headset when you can build your own? For now, the pickings are pretty slim for quality VR apps, and shelling out for an expensive headset is sort of like buying a promissory note on future fun yet to be developed. But fret not, frugal types, because you can still experience all VR has to offer on the cheap by building your own VR goggles. So what is Google Cardboard anyway? Simply put, it’s Google’s innovative attempt at putting a set of VR headsets into everyone’s hot little hands; it’s also a cool crafting project for kids of all ages too. 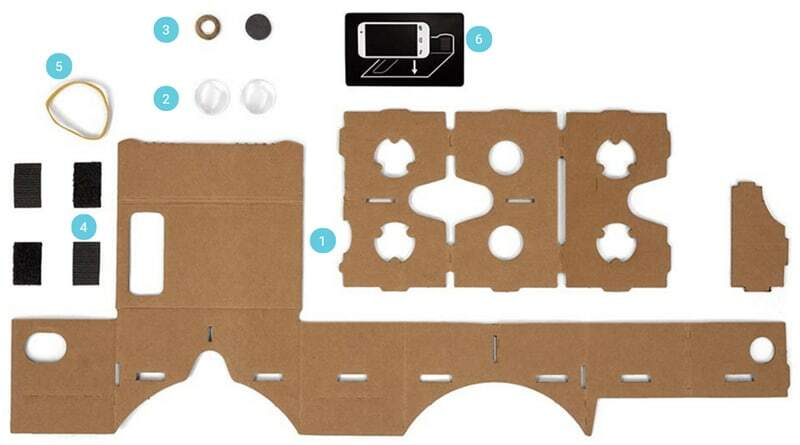 Just download the instructions and build your own pair of Google Cardboard VR goggles out of any piece of scrap cardboard you have laying around. Maybe it’s a cereal box, a diaper carton, or a cardstock FedEx envelope (hey, it’s not our fault they give those shipping materials away for free.) You can make your own Google Cardboard VR headset out of just about anything, however, if all that sounds like a bit much for you, then for a mere 10 bucks, you can just buy a cardboard VR headset outright and experience the technology on a budget. The downside to Google Cardboard, is they typically do not have head straps or face padding, so you’re stuck holding that uncomfortable piece of corrugated material up close and personal. Cardboard headsets also have no focal adjustments and the lenses are usually just cheap plastic, so it’s definitely not the best way to go unless you love origami. With plastic VR headsets, there’s two types of lenses, and which one is best largely depends on personal preference. There’s spheric lenses, which is just a fancy way of saying round, and then there’s aspheric, which is a fancy way of saying rectangle. No matter which style of lens you choose, round or rectangle, they’re all going to be polycarbonate, which is just a really, really fancy word for plastic. And if you do happen across a VR headset using glass lenses, they’ll probably charge through the nose for it, which is arguably useless given that most prescription glasses use polycarbonate too. Sure, plastic ain’t great for landfills, but it can sure make for some great optics. These are the most common lenses you’ll find in VR headsets, however, they are definitely problematic, particularly if you wear glasses. Spheric lenses tend to create a halo or blurry effect in the periphery of your vision, and over time, this can lead to dizziness and potentially some serious headaches. However, if you’re looking to get into VR on the cheap, then spheric lenses are a good way to go and used in most cardboard headsets. These are more rectangular in shape, offer a wider field of view, and don’t suffer the same halo or blurry effects as round lenses. They also work better for people who wear glasses, particularly bifocals. Typically, aspheric lenses are only found in plastic VR headsets and often cost a little bit more. But they are well worth the investment if you plan on being a VR aficionado. Cardboard headsets don’t offer focal length and pupillary distance adjustments of any kind, and you sort of have to just take what you get in that regard. But the best VR headsets will offer both pupillary distance and focal length adjustments, which is particularly important for people who wear glasses. A pair of headsets with quality fine tuning controls can eliminate the need for glasses altogether, because the adjustments will mimic your eyeglass prescription well enough to enjoy your VR sessions without the need to wear prescription glasses under your VR goggles. If you wear prescription glasses, be sure to get a VR headset with a form factor large enough to accommodate your prescription frames. Yes, it’s sort of a pain to wear both VR goggles and prescription glasses at the same time, but alas, this is your lot in life. If your prescription isn’t so strong that you look like you’re wearing carbonite bricks on your face, then you can probably make do without them while enjoying VR; particularly if your headset has good focal adjustments. 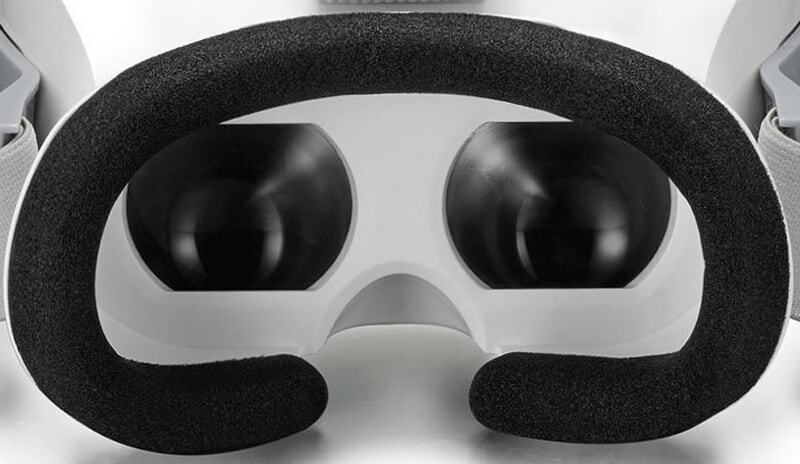 But if you have particularly bad eyesight, then a wide form factor VR headset is a must. Sure, this doesn’t sound all that meaningful to the naive, however, don’t underestimate how heavy your phone actually is once it’s balancing on the bridge of your nose. Add to that a weighty headset, and you’re talking some serious sinus pressure. A headset with ample padding where your face makes contact with the goggles is essential for comfort, and a 3 point strap system will take the load off your nose and distribute it evenly around the sides and top of your head. 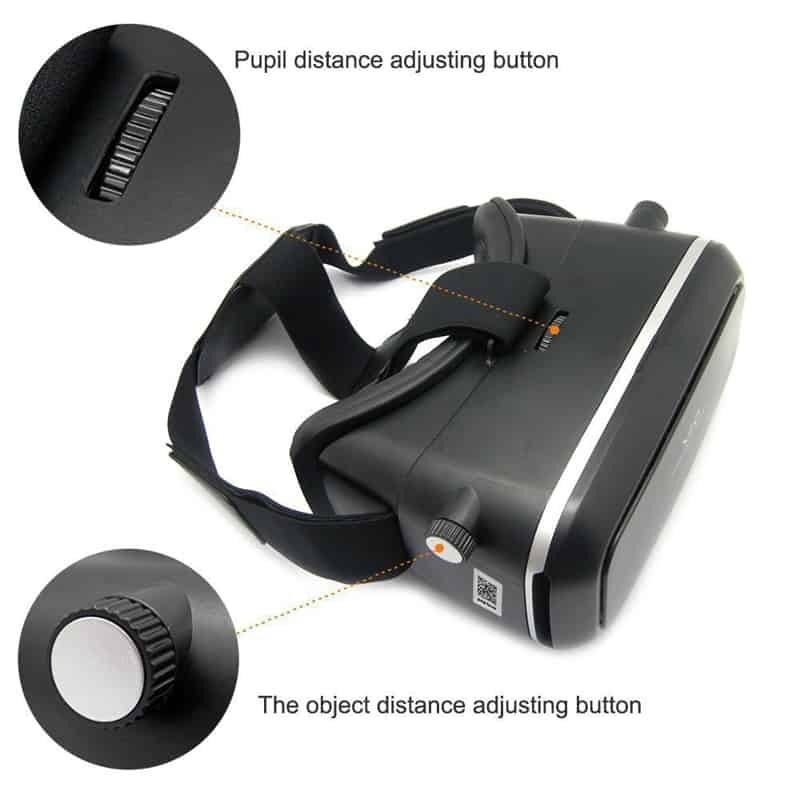 In addition to side straps attached to the left and right sides of your VR goggles, be sure to get a headset with a center strap that goes overtop your head as well. Good straps and quality padding will keep your VR headset securely in place, and make for such a comfortable fit, that you may even forget you’re wearing them. 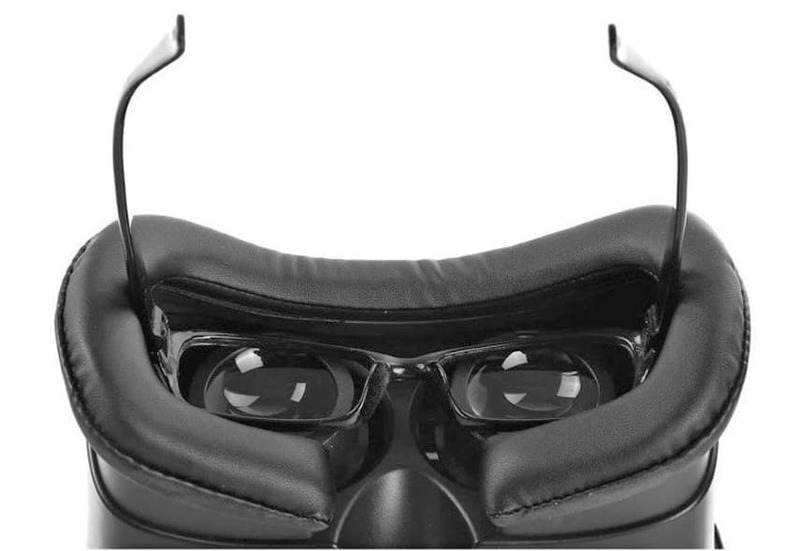 All VR headsets use your cell phone as the image source for the VR you’re viewing. To accomplish this, your phone will display two identical images side by side, much like a traditional Stereoscope. To view the stereoscopic imagery properly, you’ll have to place your cell phone inside your VR headset. The phone compartment is usually closed with a latch, or sometimes Velcro, as is the case with Google Cardboard. Alternatively, the Gear VR headsets shipping with the Samsung Galaxy S7 use a clamp mechanism that latches onto the edges of your phone and adjusts to accommodate different size devises. Novel as it sounds to have a precise fit clamped around your phone, clamping mechanisms like this are often weak, and your expensive new phone could drop out unexpectedly. The best VR headsets use a hinged door compartment that encloses your phone within the VR headset, which is much more secure and less prone to accidental drops. Your phone will be held in place with suction cups, or a clamping mechanism similar to the Gear VR headsets, but your phone will remain safely within the phone compartment. Some VR headsets try to up the ante by offering free remotes or game controllers with their headsets. While this is rather novel, and we all love getting free stuff, the fact of the matter is, very few apps actually make use of game controllers as of yet, so the need for a controller isn’t really justified. But hey, if you find a headset you like and it comes with a bonus controller, then by all means, grab it, and maybe one day soon, you’ll actually find a use for it. Okay, so you’ve done your homework, built a rad pair of VR goggles out of an old shipping box, or sprung for a pair of the best VR headsets money can buy. Now what? Paul McCartney VR – stand onstage next to Paul as he sings Live And Let Die to a sold out crowd at Candlestick Park. It’s pretty cool and gives you a rock star’s vantage point amid a sold out arena of fans, complete with exploding pyrotechnics. FullDive VR – this app has the rather ambitious goal of trying to offer you a full VR Android operating system. Open files, surf the web, play videos, take pictures, launch apps; it’s all rather innovative, but sort of wonky and belabored too. Still, it offers a glimpse as to the possibilities with this emerging technology. VR Roller Coaster – throw your hands in the air like you just don’t care, and hopefully don’t puke your guts out while enjoying this VR thrill ride. Sure, it’s not as good as the real thing, but it’s pretty dang fun, especially for chickens. Discovery VR – yes, as in the Discovery Channel. This cool app offers behind the scenes clips and deleted scenes from your favorite Discovery Channel TV shows. The network promises to add more and more content as the technology evolves. Virtual Reality 360 Degree Skydive – ever wondered what it’s like to jump out of a plane? Well, here’s your chance; and your bathroom is just a short sprint away, just in case. VR Crossy for Cardboard – think old school Frogger but with 360 degree views. Hop over to the other side of a busy street and try not to get squashed by an oncoming car; yeah, good luck with that one. Insidious VR – in case crapping your pants in a movie theater is just too tame for ya, try slapping on your VR goggles and giving this horrific app a whirl; just remember, all those hairs standing on end are very real, not VR. Now that you know all you ever wanted to know about VR, and then some, how about making your own pair of cardboard VR goggles? Post your creations in the comments below and be sure to use the silliest packaging possible. So swipe grandpa’s adult diaper box and go to town; just be sure it’s clean before putting those goggles up to your face!